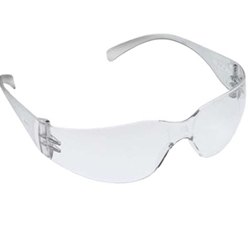 Lightweight, unisex Virtua protective eyewear combines versatility and value with high wraparound coverage, polycarbonate construction with a hard cost, and scratch-resistant lens for a comfortable, contoured fit. This eyewear provides over-the glass coverage, and the polycarbonate lens absorbs 99.9% UV. Meets the High Impact Requirements of ANSI Z87.1-2003.
? Clear hard coat lens.
? Polycarbonate lens absorbs 99.9% UV.
? Meets the High Impact Requirements of ANSI Z87.1-2003.